The use of concrete caissons as a means of breakwater dates back to the beginning of the twentieth century. The first caissons have been designed by the Dutch but not used in practice. In other countries caissons are being used during the development of artificial harbours. 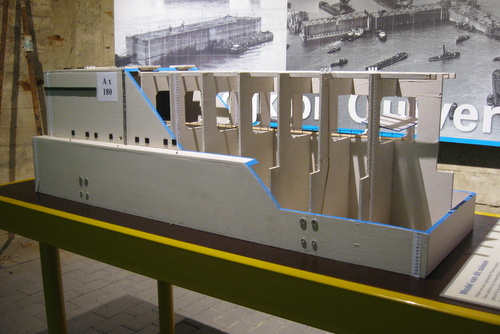 Winston Churchill in 1942 orders the design of an artificial stand-in harbour on a stormy deep sea coast, able to receive ships and discharge material of the allies on an Atlantic coast. The idea of "sinkable breakwaters" from the beginning of the twentieth century is being revived again and the final design of the caisson is of a rectangular shape and they are being called Phoenix caissons. In total 212 of these Phoenix caissons are being constructed for the purpose of the Mulberry harbours in Normandy. Of those 212 a number stayed behind in England because they were no longer required in France in 1944. These have been used in a later stage after the war in order to close openings in the dykes amongst others in Walcheren near Rithem where two of them still can be distinguished as they raise out of the sand (beetles), as floats of a pontoon bridge, the closing of a recess of the coast called the Braakman in Zeeuws Vlaanderen, the Brielse Maas in Zuid Holland, Kruiningen and in the Veerse Gat. 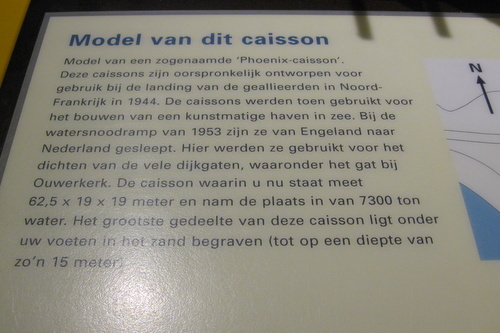 From the English Portland the last caissons have been tugged to Zeeland and four of them have been used in Ouwerkerk on the Isle of Schouwen-Duiveland in order to cut off a tide stream through a hole in the dyke after the large inundations of 1953. The measurements of the caissons are 60m long, 20m wide and 20m high (approx 180 x 60 x 60ft). After having been positioned in the dyke construction, they have been filled with sand so you walk on a layer of 13m of sand (approx 40ft). The routing through the caissons is partly underground. At the end of the first caisson you descend and only between number three and four you surface again. The caissons have been nominated to become part of the national heritage in 2003 after having been protected since 1965. 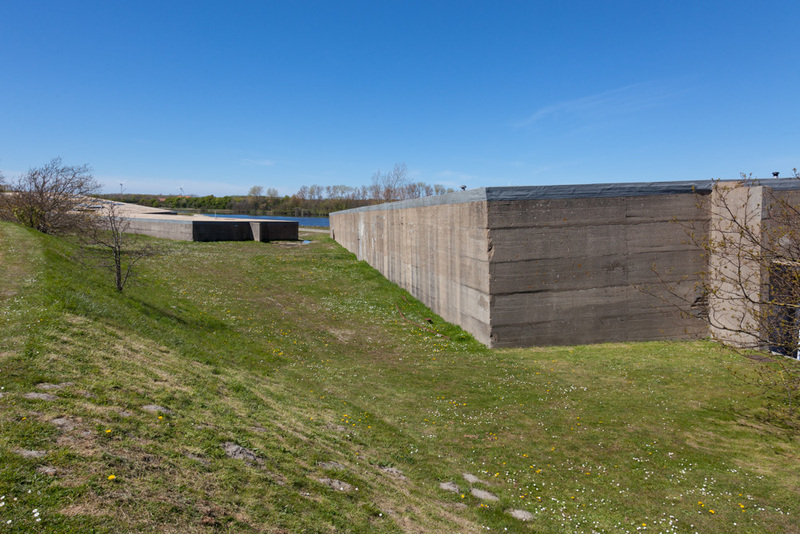 In these caissons the museum dedicated to the inundations has been installed and memorizes the disaster of 1953. Picture number 1: Overview of three out of the four caissons in the dyke construction. Picture number 2: Mock up of a Phoenix caisson AX180. Picture number 3: Prescription of a caisson. 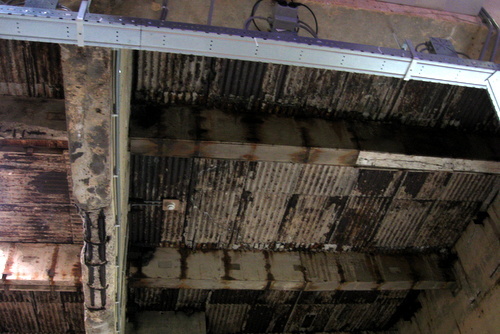 Picture number 4: The insides of a caisson. Picture number 5: The stand up hight inside a caisson. Mock up of a so called Phoenix caisson. Those caissons were originally designed to be used by the invasion of Northern France in 1944. The caissons were destined to be used in the construction of an artificial harbour off the coast. During the inundation disaster of 1953 these have been tugged from the UK to the Netherlands. Here they were used to close the broken dykes amongst which the hole in the dyke at Ouwerkerk. The caisson where you are now measures exactly 62,5 x 19 x 19 meters and replaced 7300 tons of water. 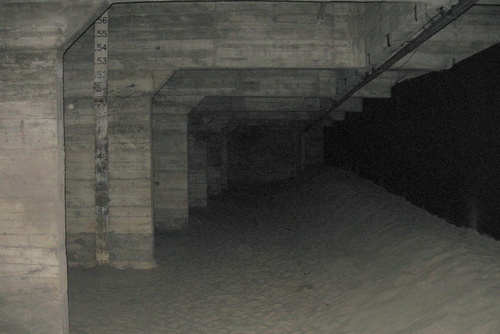 (approx 188 x 57 x 57 ft.) The major part of the caisson has been buried below your feet in the sand and reaches about 15 meters deep (45 ft). Phoenix caissons floating behemoths for peace and security. Using Phoenix caissons in Dike Repair in Zeeland, 1945-1953. 2002 edition.